Looking for a way to add sparkle and impact to a modest home? Some experts suggest a fresh coat of paint, while others recommend a new floor. Unfortunately, even a change of color or flooring won't make a yawn-inducing interior come to life. To create character and distinction in an ordinary room, consider adding some structural detail with solid hardwood mouldings and trim. Hardwood mouldings lend star quality to any room. By creating contours and contrast, bold lines and fine detailing, moulding and millwork lend substance and distinction to an otherwise-ordinary room, adding the architectural punch that many modern homes are lacking. Years ago, architects and homebuilders used substantial architectural ornamentation to make a home unique and to reflect the wealth and taste of its owners. Crown mouldings, wainscoting, chair rails, wall and window framing made from hardwoods lent substance, character and beauty to a home's interior. By contrast, today's cost-effective building practices have left little room for this kind of distinction in modern homes, says master carpenter Matt Garnett. Over the past ten years, there has been a housing boom in the area," says Garnett, a design consultant for Just Mouldings, a D.C.-area firm that specializes in custom designed architectural moulding. "Speed and efficiency in building have streamlined the choices a homeowner had in its design. Most homes have only very simple, basic mouldings, with no way to upgrade." "A single application of crown moulding," notes Garnett, "yields astonishing results. It softens the transition between ceiling and wall, and sets the tone for more of an elegant feel in the room. It works well in all kinds of homes, from multi-million dollar homes to a three-bedroom townhouse." Installing hardwood crown mouldings in an average room can cost an additional $300 to $500, depending on the wood. But when considering resale value, says Garnett, "the extra measure of character and elegance in a well-trimmed home is a real advantage in a competitive market." If you want impressive results with your moulding, here's a suggestion: Go wide. Once you decide to add baseboard or crown moulding to a room, make sure it's not so narrow that it disappears into a corner. "Three to four-inch tall baseboard might not catch anyone's eye, but moving up to a six-or eight-inch size will bring on a WOW!" says remodeling expert and syndicated columnist Bill LaHay. 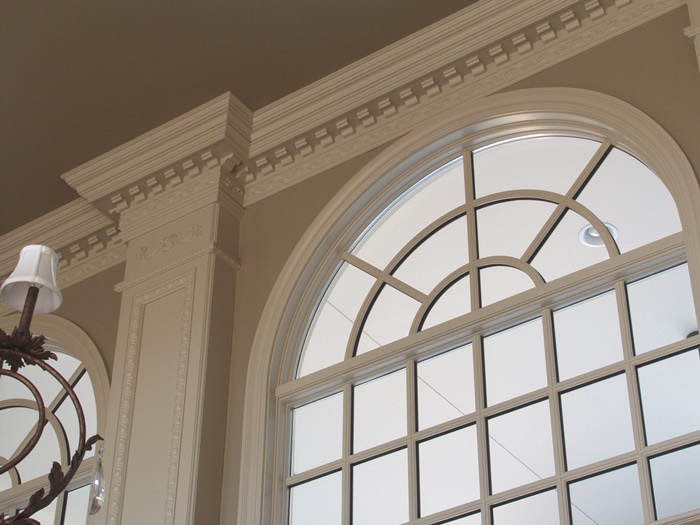 It's not just the mouldings and trim, but how you design and use it that can bring costs down to size. Layering small crown and decorative mouldings onto a flat board can be an impressive alternative to a single, wide crown moulding. "If the goal is more texture, depth and accents for your walls, using multiple smaller mouldings can be the better route - if they're combined well," suggests LaHay. Or think beyond crown and baseboard mouldings to door and window casings, chair rails, picture rails and wainscoting to add instant stature and definition.